I greatly dislike sewing and almost every other stocking pattern I found had a part that involved sewing, so my goal was to make a fully crocheted in one piece Christmas Stocking. This pattern will work with any yarn and appropriately sized hook to match the yarn you’ve chosen and as it’s a decorative only item not meant to be worn, it will just make a larger or smaller sized stocking. In testing - worsted weight and an H hook produced a roughly 3x5in stocking suitable for an advent calendar or a Christmas tree ornament (I made them initially as decorative items to be worn by members of the chorus I belong to during our Holiday concerts). 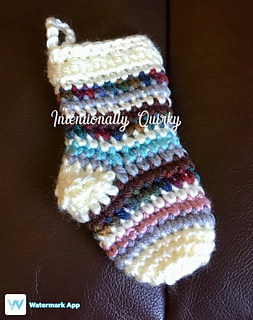 Using Super Bulky yarn and an N hook produced a stocking that was roughly 11 inches top to toe in length — the smaller the hook/yarn, the smaller your finished stocking and vice versa.